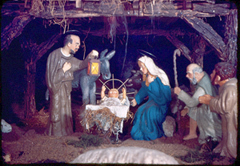 A full restoration job is now complete on the famous Nativity scene that was built by German prisoners during World War Two while at a P-O-W camp in Algona. The scene is half-life-sized and composed of 60 concrete figures finished in molding plaster. The Algona First United Methodist Church Men’s Club is the caretaker of the nativity scene and recently received a major donation for the renovation. Chairman Marvin Chickering says once they started looking at repairs to the building that houses the Nativity, they realized work needed to be done to restore the figures, too. Chickering says there needed to be repairs made to cracks as well as a good cleaning of the 65-year-old figures, since it had been about 15 years since the last time they were restored. He says they made several repairs and changes to the room that houses the nativity, including raising the ceiling by four feet to provide visitors a better view. He says they brought most of the figures out into the display room since they didn’t want to risk having those damaged while the ceiling work was underway. Chickering says the Nativity is a part of the whole story surrounding the housing of 10,000 German prisoners of war in Algona from April 1944 to February 1946. Eduard Kaib was an architect by profession but was a non-commissioned officer in the German army. Kaib and five of his fellow prisoners built the scene and paid for all the materials themselves, using money they earned by working in Iowa farm fields. Chickering says everyone who visits the Nativity appreciates the history behind it. He says he looks at it as “totally a God thing,” with the Lord bringing Kaib to the Algona camp and being the “brain thrust” behind the Nativity’s construction. He calls it “truly a miracle.” Kaib returned to Algona in the mid-1980s prior to his death in Germany in 1988. Visitors have the opportunity to hear Kaib’s own words about the Nativity. Kaib says he never intended to create a piece of art, with the only intention to bring the joy of Christmas to the camp. The Nativity scene is located at the Kossuth County Fairgrounds. People can visit Monday through Saturday from 2:00-9:00 P.M. and on Sundays and Christmas Day from noon until 9 P.M. For more information, visit: “www.pwcamp.algona.org“.